Purpose : Automation of a microwave oven. Product temperature regulation within the oven enclosure. Circular switching of magnetron operation. 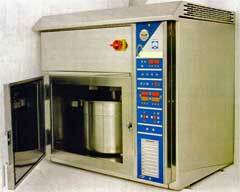 Control of a mixing motor variable speed drive (application: food industry, cosmetics). Presentation : Metal control box with a keyboard-display unit on the front face, at the back all the removable connectors. All the electronic components are grouped together on two printed circuits (CPU, keyboard, display + power supply). The front face is waterproofed against water spray and running water. Operation in a disturbed environment (temperature, micro- waves, etc.). 7 segment LED display + mechanical keyboard.